Catherine Tresa is the beautiful bombshell in today’s most awaited film Gautham Nanda. She let us in on her life from the time she moved to India, her days as an amateur model and now when she has become one of the most wanted actresses in all four south languages. Read on. You were born and brought up in Dubai; was it difficult to adjust when you moved to India? Initially yes, for the first month or so it was difficult because the change was drastic. One has to adapt because everything is different, whether it be the people, restaurants, roads, coffee shops, generally it was a lifestyle change so it took me about a month to adjust. Did you start off wanting to be an actor or a model? Actually I did not want to be either. It wasn't really a conscious decision. My parents always liked me being on stage. I was a very shy child so they pushed me from a young age to be in front of people to increase my confidence. I ended up learning the piano, singing and even participated in toast masters (public speaking). As I got into my teens I liked being on stage, entertaining people and being appreciated for it. I liked the applause. *Laughs* I came from an academically oriented family. They placed a lot of importance and emphasis on studying well. When I was in school I was a top notion student but I didn't want to just go to class and come back. I was always into a lot of extracurricular activities. I volunteered with environmental groups apart from my other crafts. And once I shifted to India to do my degree, I didn’t know anyone so I dabbled in a bit of amateur modelling as an extracurricular activity. When you are a student you could always use the extra pocket money! You’ve acted with popular actors like Allu Arjun in Telugu, Karthi in Tamil, Upendra in Kannada, Prithviraj in Malayalam. Did you find any difference between the different industry's stars? The differences are person to person; everyone is unique in their own way. That’s what makes us individuals. The difference was more to do with languages than anything else. Karthi was Tamil speaking actor in a Tamil film and Arjun was a Telugu speaking actor in a Telugu film. But I have to say that Karthi also knows Telugu and Arjun is very good at Tamil. Do you have a favourite industry? When I started out in Kannada, it was because I was in Bangalore. That was when I started watching a lot of south films and understood what they were all about. I would watch Telugu and Tamil films and I liked them so much that I wanted to be in them, which is what I’m doing right now. I’m focusing on these two languages. You’ve said that Gautham Nanda will be your most glamorous movie yet. What does glamorous mean to you? To me glamour is anything that looks visually appealing. Cinema is a visual medium. I don’t believe that glamour and skin show go hand in hand. Usually we have the notion that glamour is associated with being western or a modern clothed woman. I don’t agree with that. My first film in Tamil was Madras with Karthi which received a lot of commercial and critical acclaim. When we started our director told me that he doesn’t want me to have makeup on. I said yes we are meant to be based in north Madras in a housing board so it wouldn’t make sense for me to have makeup. Then he said, ‘but I don’t want it to look boring or sad’. I said, ‘I think I’ll still look good, I can carry it off’. He said that regardless of the clothes or lack of makeup the character is still glamorous. If you see in the film the salwars I’m wearing, none would have cost more than 1500 rupees but it looked so good. Even now people in Tamil Nadu still identify me with that role. A lot of people said that I looked beautiful and very pretty. So, it doesn’t always have to be modern clothes to be visually appealing or be classified as glamorous. What is your take on being one of the two leading ladies in most of your Telugu films? I don't see why that is an issue. We are all playing characters in a film so I think if it requires more than one actress then that’s great. Also I think it’s pretty standard for a lot of our movies to have two or three heroines. Those are the scripts that come my way. More so that's not my deciding criteria. The deciding thing for me is the kind of character offered to me, the weight it has, the script on whole, and of course the team, everyone has to put in a 100% of their effort for a movie to come out well. These are the factors I think about while taking up a project. I don’t think about who is in it or who is not, that is trivial. 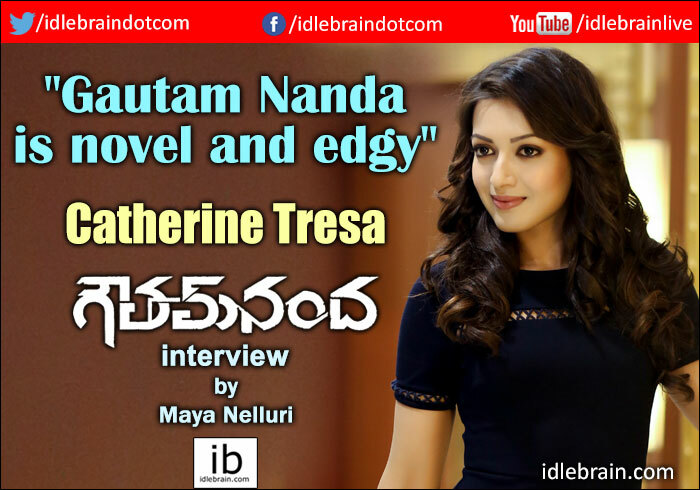 Why did you pick Gautham Nanda? I liked Sampath Nandi’s outlook on movies, more so with this film. I’ve watched Rachcha and Bengal Tiger and I liked them. With this film what I liked most is the point of it. I thought it was very novel, it’s very edgy, contemporary and universal. Someone from another language could also watch it because of content. It’s not just a Telugu film. I’ve even told him it’s the best script he’s had. Now that the shoot is over, I see that what he wanted to convey has come out really well so we are confident. How was your experience working with Sampath Nandi? He’s a really young director who has a lot of energy. He’s very clear about what he wants. He wrapped up the film without delays. The number of days shot were exactly as planned so it requires a lot of pre-planning and organisation. Also, I am someone who needs to know what I’m doing and he gave me a lot of clarity. It was really nice and easy to work with him because we were both on the same page. Also, Sampath's got a good eye for aesthetics. He knows how to make things look beautiful, he understands beauty. It’s not just to do with the women. In this film Gopichand’s look is bang on. Also the DOP Soundar Rajan and him make a great team, everything’s come out beautifully. Tell us about working with Gopichand. Off screen he is a very calm and quite person. We both have that in common and I like that about him. But he totally transforms in front of camera. As soon as the camera is on his whole attitude changes, he’s super confident; he knows what he’s doing. He does his shot really well and then when he comes to watch his shot he’s calm again. What have you got lined up in the future? After Gautham Nanda I have Nene Raja Nene Mantri coming up with Rana and director Teja on August 11th. It is another fabulous film. It was a special film for everyone involved because of what we tried to achieve through the story. It's going to break a lot of stereotypes so it will be very exciting to watch. I love the character Devika Rani that I’m playing. It’s going to be a standout role. Any plans of going to Bollywood? I'm not going to Bollywood. *Laughs* I'm happy with the roles I’m doing right here right now. I also don’t plan too much because I don’t think planning works. So I’m focused on what’s on my plate right now and that’s my priority.